We have a number of accessories available to really round out your outfit for graduation. 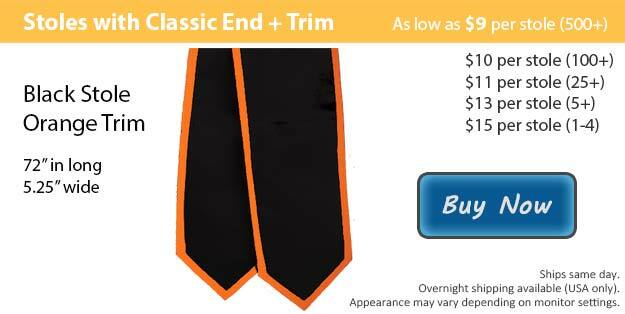 Our graduation stole in black with orange trim can be a marvelous way to accent your attire. The orange trim makes for a perfect contrast against the black. If it is time for you to get ready for your graduation ceremony, Honors Graduation is here to help! We have everything that you've been searching for and we make it our mission to have you looking amazing for this monumental day in your life. We can help you with the basics all the way to customized items to make your wardrobe exactly the way you want it to be. We know that it takes an enormous amount of effort to accomplish your goals and earn your degree or diploma, so we have done our best to make sure your shopping experience is as quick and painless as possible. It important to dress the part as your family and friends will all be there to cheer you on. We have special package deals that give you all of the necessities you are required to wear by most schools in order for graduates to walk during their graduation ceremony. At Honors Graduation we have multiple styles of graduation stoles to accommodate your needs. Choose between our classic option or the angled cut to perfect the look you are going for. All of our stole color options are available with any contrasting trim as well as without trim for a solid single colored stole. If you are interested in adding a design of your own, we also do embroidery here at Honors Graduation and would be happy customize your stole for you. Custom stoles are common for students to wear at their graduation to signify a special group or club that they are apart of.